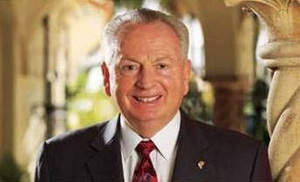 Rex G. Maughan is an American businessman, real-estate investor, and philanthropist. He is the founder, president, and chief executive officer of Forever Living Products. Maughan was born on November 20, 1936, in Logan, Utah. He grew up on a ranch in Soda Springs, Idaho, and served as a missionary to Samoa for The Church of Jesus Christ of Latter-day Saints, of which he is a member. Maughan maintained his affection for the people of Samoa and in later years contributed to the preservation of Villa Vailima, the estate of author Robert Louis Stevenson near Apia, Samoa. Maughan turned it into a museum. He has worked to provide clean water for communities in Samoa. In 2005 he accompanied a BYU Television team to American Samoa to coordinate installation of a satellite receiver he had donated. He has also worked with the U.S. parks system in American Samoa to preserve rain forests. Maughan met his wife, Ruth, while they were students at Brigham Young University. After they moved to Arizona, Maughan finished his bachelor’s degree in business administration at Arizona State University, with emphasis in real estate, taxation, auditing, consolidations, and mergers. They raised their three children in Arizona. In the early 1960s, he began investing in land while still working as an accountant. He worked two or three jobs while he continued to invest in real estate and ranching. He worked his way up at Del E. Webb Construction Company for thirteen years, eventually becoming vice president. In 1978, Maughan formed a multilevel marketing company, Forever Living Products, which initially consisted of lotions made from the aloe vera plant but grew and diversified into a broad range of other products. In 1981, he expanded his company into the resort business, Forever Resorts. Maughan is a member of the BYU President’s Leadership Council Executive Committee. He was inducted into the ASU Alumni Hall of Fame in 2007. He was the recipient of an honorary Doctor of Humane Letters degree from ASU in recognition of his exceptional business accomplishments, substantial contributions to this university, and his inspirational commitment to service. This page was last edited on 26 December 2014, at 21:13.